← Emma Stone’s haircolor: most popular at realhairstyles! When Anne Hathaway first garnered attention in the Princess Diary movies, who knew how versatile her career would become? Back then she was a pretty face who could sing and dance. Today she has garnered critical attention in movies and theaters and she’s bound to chalk up more kudos in the movie version of Les Misérables. Her drastic do-over a few days ago puts her in the ranks of the most daring celebrities today–names such as Rihanna, Agyness Deyn, Michelle Williams, Carey Mulligan, Lady Gaga, Natalie Maines, Ginnifer Goodwin, Janet Jackson, Katy Perry, etc.–who don’t blink an eye before changing their hair. But this isn’t the first time Anne has changed her hairstyle for “work.” In her first critically acclaimed role in Rachel Getting Married, Anne had her hair in a short bob (below right) that varied from pretty messy to pretty cute (depending on the volatile mood of her character). 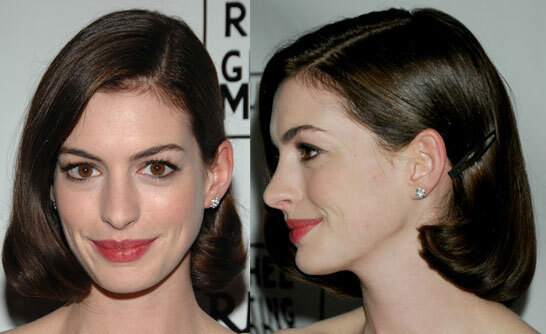 When that movie premiered, Anne’s hair had grown past the shoulders and was styled in a retro glamour look. As for her long hair, we don’t have to say much–everyone knows her trademark mane. However, it’s worth noting how much versatility she got from her hair when she co-hosted the Oscars in 2011. She wore seven different hairstyles that were done during quick costume changes by Frédéric Fekkai celebrity stylist Adir Abergel. This entry was posted in Celebrity Hairstyles, Celebs, Movies, star hairstyles, star makeovers and tagged Agyness Deyn, Anne Hathaway's hair, Anne Hathaway's short hair, Ginnifer Goodwin, Janet Jackson, Lady Gaga. Bookmark the permalink.